It was the summer of ’06, and I was in the midst of changing hormones, understanding my femininity, and rebelling at almost every level. My friend’s mother surprised us with a trip to NYC to go shopping for clothes—the ultimate dream of any fifteen year old girl. It was our last shopping day and we stumbled upon an outdoor sale of massive proportions. I had just purchased a “totally authentic” Juicy Couture pink track suit (we all remember those, right?) and I was getting a bit hungry. Ignoring my friend’s mother’s strict instructions to not eat any of the street food—whenever the carnival came around town she also gave warned us about talking to the “carnies”, so full of wisdom was Mrs. Fontaine—I stole away to a chicken stand when she wasn’t looking. Placed haphazardly on bamboo sticks, the chicken was juicy and fragrant, with hints of pink insides and oozing green pus (which my friend said reminded her of her infected belly button ring); hunger inspires stupidity in man. Neglecting the obvious signs of salmonella, I munched away greedily. Mrs. Fontaine was less than impressed and I spent the next ten days firmly glued to the toilet seat, unable to keep in Gatorade or broth, regretting that oh so delicious and misguided decision. Out of fear, I didn’t eat chicken for many months. My mom forced me to start eating it again, but I always found it too dry. If only I could find a chicken recipe that would match the juiciness of the chicken from the street vendor, but spare me the week of lower intestinal havoc. Although I’ve made many satisfying chicken recipes over the last several years, I think this one just has to be number one. The inside was juicy and flavorful—a bit salty but not terribly overpowering. The skin was soft, but not gooey, and absolutely succulent; move aside, crispy rotisserie chicken skin, for there’s a new hen in town. What really made this humble poultry the piece de resistance was a slow, 30 hour marinating brine bath. Check out this article for the science behind the wonderful world of brining. This recipe was featured on Smitten Kitchen (so you know it’s going to be good) and she slightly adapted it from Nigella Lawson. Whisk buttermilk with garlic, table salt, sugar, paprika and lots of freshly ground black pepper in a bowl. Place chicken parts in a gallon-sized freezer bag (or lidded container) and pour buttermilk brine over them, then swish it around so that all parts are covered. Refrigerate for at least 2 but preferably 24 and up to 48 hours. **If you don’t know where to buy buttermilk (or need to go with the non-dairy alternative) you can make something similar. For every cup of milk, put in one tablespoon of lemon juice. Stir together and let the mixture sit for 10 minutes. You’ll notice it starts to curdle. There, now you have butter milk’s first cousin, so there is no excuse not to try this out! 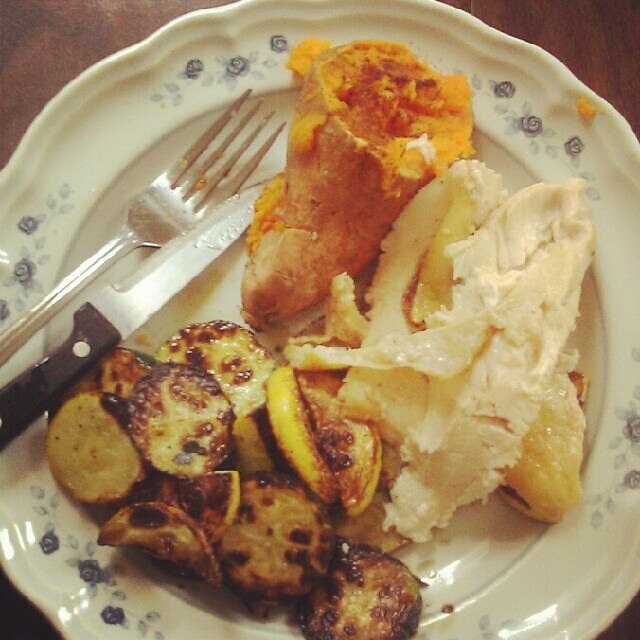 Throw together some pan seared vegetables, a plump sweet potato (I won’t tell anyone if you want to use a bit of butter and cinnamon), and you’ve got yourself a hearty dinner that’s sure to make your taste buds gyrate!